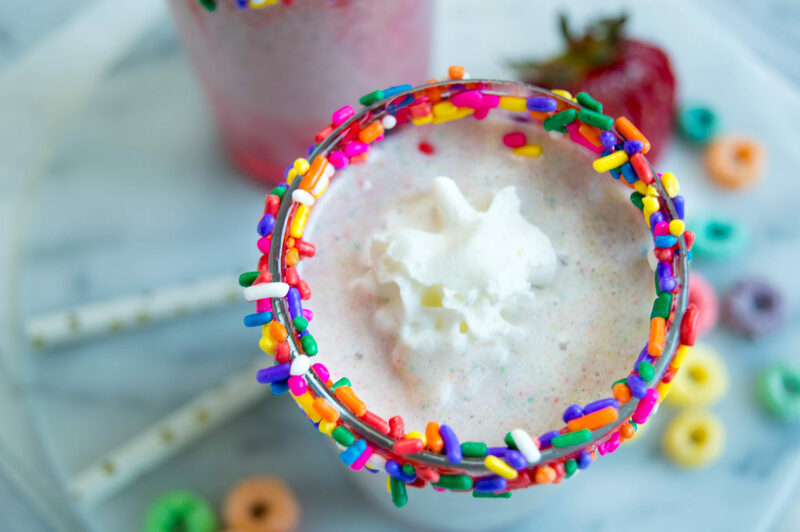 This Delicious Froot Loops Milkshake is the Bee's Knees! 1. Start by crushing up your Froot Loops cereal. I crushed mine in a bowl, but my husband crushes his in a Ziploc bag. Either way is fine. I crushed mine up pretty fine, but it is going to end up in the blender, so don’t kill yourself crushing it up into super small pieces like I did. 2. Then add all of your ingredients into a blender and blend it until it’s smooth. 3. 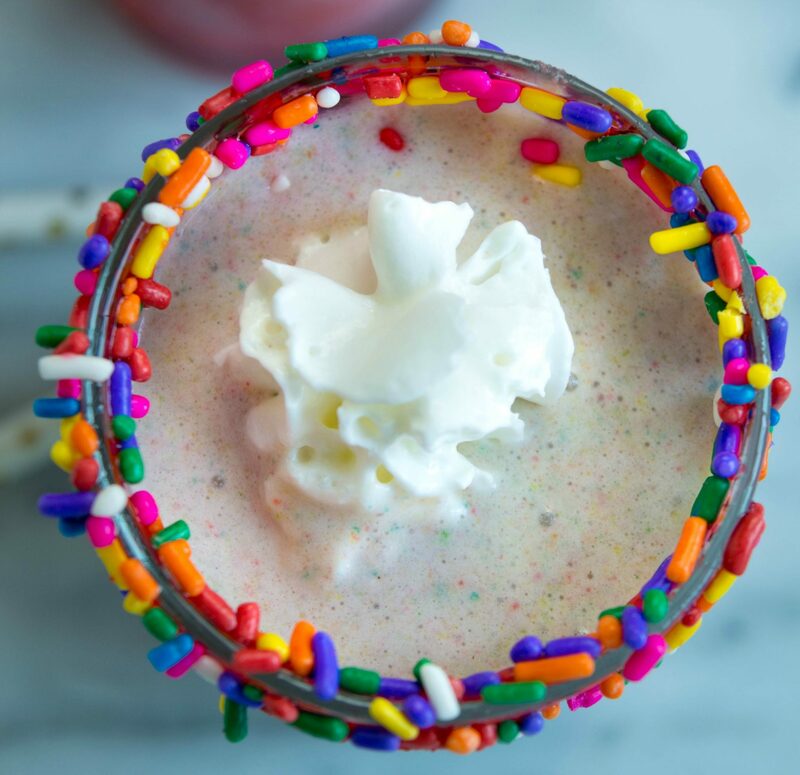 I served my milkshakes in a cup with sprinkles (or as we call them here in Boston: jimmies) on the rim because I am fancy like that. You don’t have to if you don’t want to, but it sure does make them look cool, dontcha think? 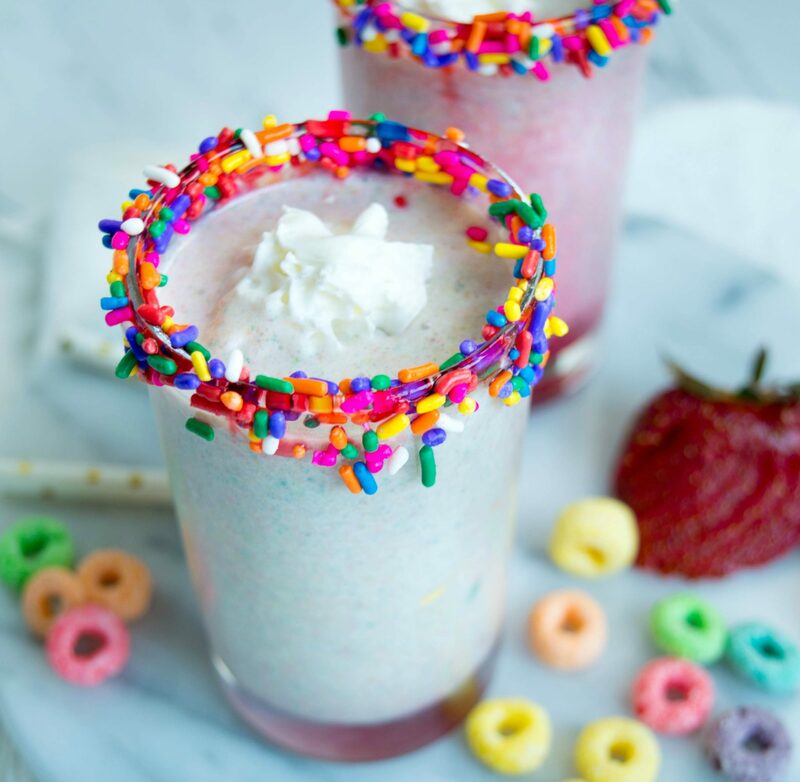 If you want a sweet treat that’s a little out of the box, try a Froot Loops Milkshake. It really is the bee’s knees! This is the cutest milkshake I’ve ever seen! I love how colorful it is and I know the kids will go crazy over it. It’s totally out of the box and looks so festive. To be honest this isn’t going to be a favorite of mine to drink. Now here is the but the grandkids are going to love this and want more. I know I’d love this! I’m all about sweet milkshakes. Sometimes I feel like they excite ME more than the kids 😉 I love that there are sprinkles on the rim as well. I love Fruit Loops cereal. This milkshake looks so delicious and playful. My daughters would love this too! 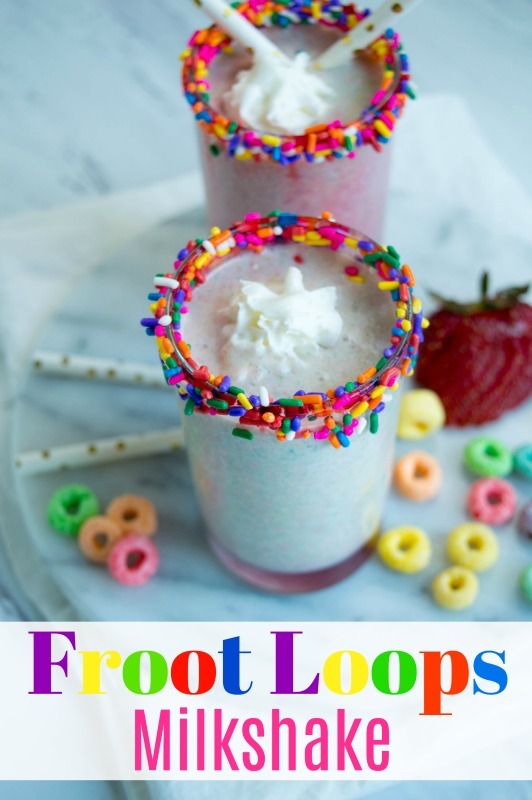 OK now, this sounds like such a fun idea of something different to do with fruit loops! I could definitely do with something like this. Nom nom nom, this sounds SO good! I know my kiddos will love it, especially with that sprinkle rim! This looks like so much fun to make and would be perfect to enjoy any day. I know my kiddos would love this. Ok, these look really good! I bet they smell fantastic too!! Love the colors on them! I would seriously whip up enough for our family if we had some Fruit Loops! I’ll have to add those to the list so we can enjoy this delicious shake! 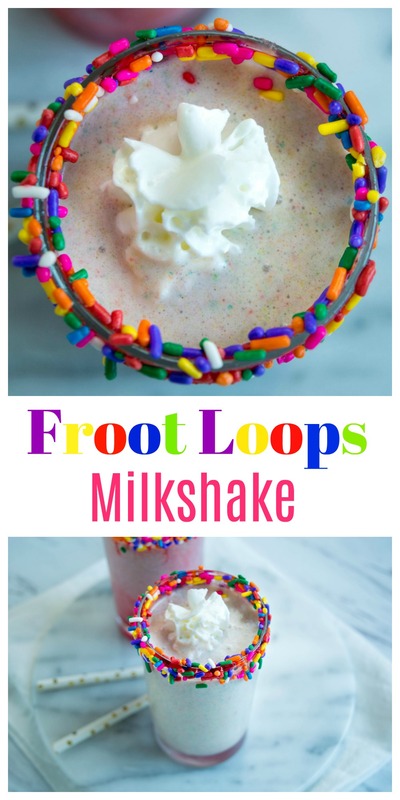 It seems like this would be a blended, sweet version of a bowl of Froot Loops! Definitely a great cure for a sweet tooth! Are you hiring for BFF? Because I definitely need to be your best friend. Forget the kids, I’m making these for myself. I’m the biggest cereal junkie, so this needs to happen. Now I know what I will make this weekend. I think that my kid will love it! This is a genius idea! My niece loves fruit loops. I’ve got to try this! Milkshakes are always a hit over here especially during the summer. Love the addition of sprinkles. They’re pretty! Those are so festive! I always loved Froot Loops when I was a kid. This looks so good! I’m surprised it didn’t turn brown or gray. It’s actually very cute with all the colors! omg, this looks amazing! Can’t wait to make this and give it a try! This looks delicious my kids will love it, great and colorful with sprinkles on top. Ok! This is so creative! My kids would love these cute little fruit loop shots. Ok! This is so creative! My kids would love these cute little fruit loop shots. Yummy! I just recently tried non-dairy milk and I think it would be perfect for this milkshake recipe. I bet the girls would love it.